A week ago, I typed “iBert” into the search box on Craigslist, along with a few other front bicycle seat names, not really expecting to find anything. Imagine my surprise when I found a recently listed iBert seat — for five dollars! Cautiously excited (since there was no picture with the posting), I contacted the owner with a few questions. She confirmed that it was in good shape and said she would just give it to me, so we set up a time to meet. 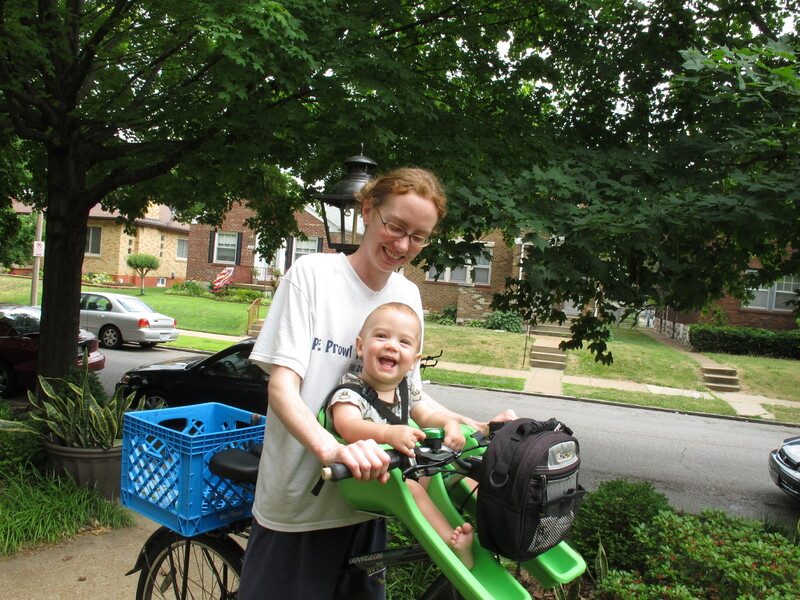 Wednesday night, Sir and I arrived home the proud owners of a lime green front bike seat! The only hold up to using it? We still need to get him a helmet. I bought a basic toddler helmet at Target a few weeks ago, but with a starting head circumference of around 19 inches, it was still slightly too big. There are toddler helmets that have a range that includes head circumferences down to 18 or so inches — we just need to get one. We should have that resolved this week, but not using our new toy over the weekend was hard. 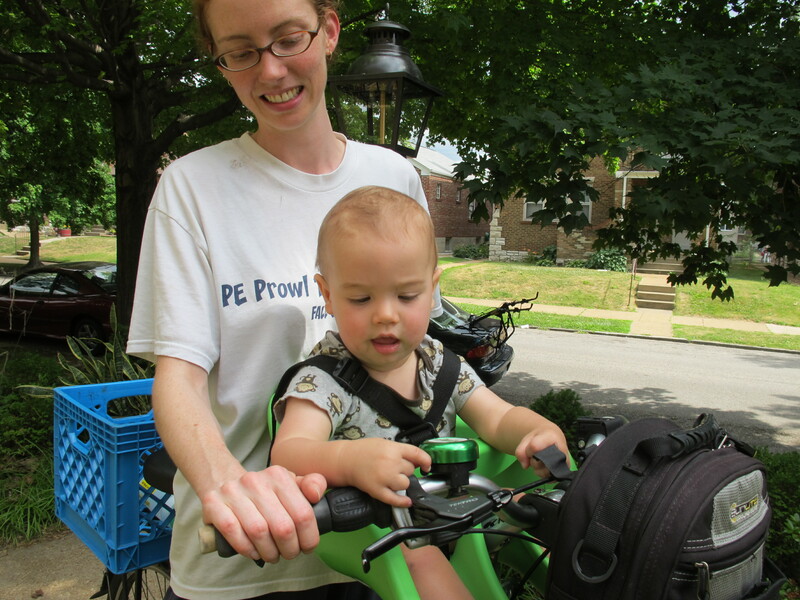 I installed the seat on Sunday afternoon and practiced getting Gabriel in and out. I resisted the temptation to go for a spin around the block. Initial verdict — he likes it much better than the trailer! I showed him the bike bell, thinking it would take him awhile to catch on and figure it out for himself. Not so much . . . .
Come back next week for the iBert test ride report. Children’s Hospital has a Safety Stop where they have toddler helmets for only $10. All that you have to do is make an appointment and let them fit it to him. We went last Spring and B has an adorable blue helmet with bugs on it that he loves to wear. My helmet has been uncomfortable (although accident free), so I was so happy to find out that they had adult helmets also for $10. Both helmets are making their wearers happy!!! Check it out, he might have to be one years old, I am not sure.